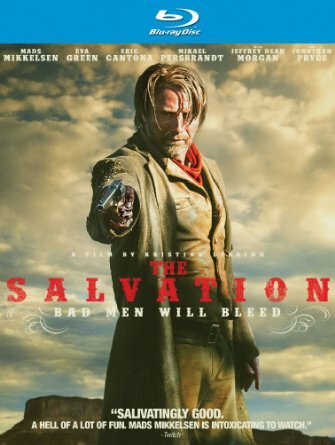 Blu-ray Review: Mads Mikkelsen is a Sure Shot in the Western, "The Salvation"
Mads Mikkelsen is best known here in the States as the latest incarnation of the infamous Hannibal Lecter. His performance on NBC’s Hannibal went largely unnoticed by the general audiences, but if you saw just one episode, you knew that this guy is one of the greatest actors working. The veteran Danish performer has had a renowned movie career in films ranging from French romances (Coco Chanel & Igor Stravinsky) to gripping Danish dramas (The Hunt) to blockbuster spy movies (Casino Royale). With The Salvation, he leads an international cast and tackles the mythology of the Old West. This excellent western directed by Kristian Levring plays out like an origin story to one of the many Clint Eastwood Man with No Name films. Mikkelsen portrays Jon, an ex-soldier from the Second Schleswig War of 1864 between Denmark and Prussia and Austria. After the war, Jon immigrates to America’s frontier to begin a new life as a farmer. With his brother, Peter (Mikael Persbrandt), they set down roots in the rugged land, before Jon calls for his wife and son to join him in the New World. The film opens with their arrival after seven long years of separation. No sooner are they getting reacquainted and tragedy strikes. On the journey to their home, Jon and his family share a carriage ride with two outlaws. When one of the filthy men begins coming on to Jon’s wife, the strong, silent Dane pulls his revolver. One thing leads to another and Jon is thrown from the carriage in an attempt to secure the safety of his son. Hours later, after running through rugged terrain, Jon finds his boy, murdered. Soon thereafter, he discovers that the outlaws also raped and murdered his wife. Jon exacts swift and brutal revenge on the two men. Then, he gathers the bodies of his beloved family and begins a slow, agonizing trek back to the home he built for them. This being a western, you know that there will be repercussions for Jon’s actions. As he digs the graves for his wife and son, the brother of one of the rapists rides into the small town nearby Jon’s ranch and demands retribution. His name is Delarue. He’s a veteran of the Indian Wars that cleared out the western states for settlers and now he extorts money from poor ranchers in exchange for protection. What they really need is protection from Delarue. Jeffrey Dean Morgan (Watchmen) chews the scenery as the villain in the film, proving to be a fine western bad guy and having a hell of a time doing it. It doesn’t take long for cowardly townspeople, including Jonathan Pryce as the duplicitous mayor/mortician and Douglas Henshall as the town sheriff/clergyman, to give up Jon in order to restore some peace in their town. Delarue and his gang capture Jon and plan on torturing him in front of Derlarue’s mute widowed sister-in-law (the always interesting Eva Green). Big mistake. They may think they’ve roped just another cowpoke, but what they’ve done is bring an expert gunman into their camp and enrage him. In the Blu-ray bonus features, director Levring proclaims his love for the American western genre. He grew up watching the films and has always dreamed of making one. The screenplay draws from many western myths, themes of revenge and redemption, good vs. evil. Everywhere you look you see the influences of John Ford, Howard Hawks, Sergio Leone and Clint Eastwood. Yet, even when drawing from these giants in the genre, the story still feels fresh. By making this an immigrant story, with Jon already an outsider from the outset, it sets him up to be the Shane of this film, a man whose soul was wounded (thanks to his war experience and the separation from his family), and a man who will use his deadly skills to free the town from nefarious men, even though they don’t appreciate him for it. Levring and his screenwriting partner, Anders Thomas Jensen, also add a subtle commentary about big business that resonates with modern society. Acting is stellar throughout the movie, in particular Mikkelsen and Green, who doesn’t have a line of dialogue because her character has had her tongue cut out by Natives. Technically speaking, the cinematography by Jens Schlosser is epic. Although shooting digitally, everything is treated as if shot on celluloid; the grand vistas, the huge establishing shots with men riding across the screen, and the stunning close ups. The creative team may not have had the budget to shoot a western like the legends did, but they produced a movie that would make Ford and Leone proud.